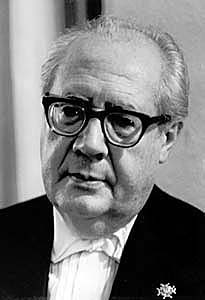 Andrés Segovia Torres, 1st Marquis of Salobreña (21 February 1893 – 2 June 1987), was a virtuoso Spanish classical guitarist from Linares, Jaén, Andalucia, Spain. He was always known as Andrés Segovia. He was one of the best known and most influential classical guitar personalities of the 20th century. He had a big influence on later guitarists, because of his performances and recordings, and his masterclasses. Important guitar works were dedicated to him by composers such as Federico Moreno Torroba. Segovia led the development of the Spanish guitar as an instrument for classical art music. As well as works dedicated to him by modern composers, he also transcribed classical works originally written for other instruments. He is remembered for his expressive performances: his wide palette of tone, and his distinctive (often instantly recognizable) musical personality in tone, phrasing and style. Segovia was especially fond of the compositions of the Brazilian musician Villa-Lobos. In the 1920s, Segovia met Villa-Lobos and commissioned a guitar study: the composer responded with a set of twelve, each taking a tiny detail or figure from Brazilian chorões (itinerant street musicians). Two films were made of his life and work. They are available on DVD called Andrés Segovia – in Portrait. His final RCA LP record (ARL1-1602), Reveries, was recorded in Madrid in June 1977. In 1984, Segovia was the subject of a thirteen part series broadcast on National Public Radio, USA, entitled Segovia! The series was recorded on location in Spain, France, and the United States. ↑ Stevenson, Joseph. "Andrés Segovia Biography". Allmusic. ↑ In a Spanish name, the first surname is the father's family name. ↑ Tosone, Jim (October 2000). Classical guitarists: conversations. McFarland. p. 7. ISBN 978-0-7864-0813-9. Retrieved 22 July 2011. ↑ Garno, Gerard (23 October 2002). Ancient Chant and Hymns for Guitar. Mel Bay Publications. p. 26. ISBN 978-0-7866-4952-5. Retrieved 22 July 2011. This page was last changed on 30 August 2017, at 20:46.